Houston teachers and science trainers came out in force as we wrapped up our 2008 Hands-on Science Boot Camp tour. It’s not the first time that weather preempted a teacher training, but the severity of hurricane Ike impressed upon us the impact this storm had on the Houston area. It was amazing to see how quickly the businesses and people of Houston rebounded. Just two months earlier, the Sheraton North Houston had a foot of water running through the front lobby and today you’d never know that anything happened. Workshop participants arrived early and were ready to roll up their sleeves and do some science. The audience consisted of primarily K-5 teachers, but we also had a strong showing of early childhood professionals, some middle school teachers and a handful of informal science educators (presenters at museums and science outreach professionals). When asked what brought them to the workshop, many participants told us that they were looking for ways to spice-up their curriculum with more hands-on activities. Getting the students engaged in their own learning was at the top of the list for almost everyone. Instead of filling out workshop evaluations at the end of the day (I refer to these as “smile sheets”), I asked the participants to hold off until they got a chance to actually try out some of the ideas, to show their students a few of the activities and to put some of the teaching strategies into practice before they shared their comments. I asked the workshop participants to share some of their experiences and suggestions as a comment to this blog post. Please give them a few days to post comment about what happened when they took these ideas back to their students. 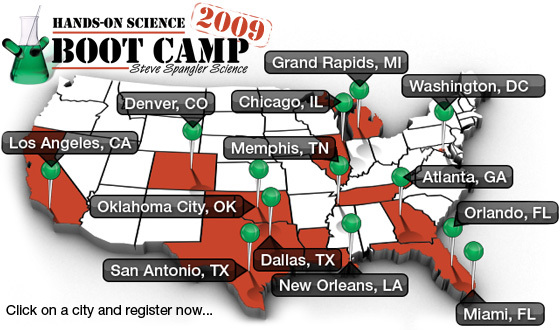 The dates and locations for the 2009 Hands-on Science Boot Camp Tour are finalized and registration is open. Kid-Friendly Elephant Toothpaste - Big Hit with Pre-Schoolers! I thought the confernce was fast paced and lots of fun. I always like to share something with my students after a conference, especially when I take a day out of the class for it. So when I got to the school the next day and my balloons were intact I decided I would use them with my Kindergarten class. They loved it of course the buzz was quite an attraction. Then I added a marble to a ballon and elicited responses as to how they thought it would compare/contrast to the other two balloons. I got some interesting responses. Mostly they thought because its size was more like the nut they thought the spin would be more like the nut. But when it lasted longer, in fact the longest some of the kids came up with the reason that the marble was smooth on all sides where the penny had flat sides even though it was round. Near the end of the lesson one of the kids shouted out, raise your hand if you think Mrs. Walker is the best teacher ever. What power that simple experiment had!! I can’t tell you how much I really enjoyed your boot camp! I registered for your boot camp a year in advance and couldn’t wait to attend. It was all and more than I could have imagined! I told all of my colleagues about your visit to Houston and that it would be the conference to attend. We were not disappointed! Your enthusiasm is contagious. I really look forward to continue doing the activities you presented and those on your web site. I wish I could inspire as many of my teachers to love science as much as I do…. We have been talking about your boot camp for the last couple of days and have made a plan to take all our science specialists to your next presentation either in San Antonio or Dallas. WOW…. I still have that smile I had that day on my face after attending your boot camp! Thanks for inspiring to be Great Teachers!